An online friend Michael Rivera passed me a track from a new producer called SKC – the track was “Awakening”. I was blown away by it – real funky drum n bass on a techy tip – capturing the futuristic vibe of No U Turn etc but driving up the funk levels even more. The tune in question was to feature as SKC’s first release and also the first release on Michael’s Inflection Records. I got in touch with SKC and asked if he’d send me a CD of bits and when it arrived, the first track “Recharger” jumped out at me. It’s crisp breaks, clean production and earworm style bassline just grabbed my attention straight away. More and more attention was working its way towards SKC and there were a few other labels interested. Kemal was keen to take it for his Negative imprint, so we sat down and had a chat about it and we thought that the release would be more suited to Nerve. So it came out as Nerve002 and to this day is still one of the best examples of that tech funk vibe that was regaining popularity at that time. Of course SKC has gone on to bigger things with labels such as Commercial Suicide but these two tracks struggle to be beaten. For info – the MP3s are unfortunately vinyl rips as I’ve lost the WAVs of the tracks – there’s only one other Nerve release in the same boat and all other uploads will be encoded from the original WAVs. More info on the mighty SKC can be found on his Myspace page. Also – as well as designing the artwork – the boys at Yuva.TV also made a wee video – here it is – in fairly low quality unfortunately (cheers for the reminder Scott!). “Recharger” is a monster tune, no two ways… When you’re after the same artist as Kemal you generally know you’re on to something and like Paul I was amazed by the CD SKC sent us. 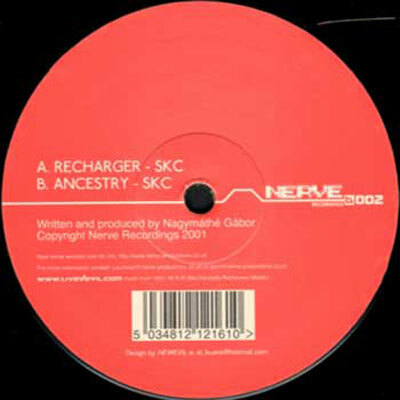 Recharger still sounds original today and I’m very proud that we picked up on this super techy style of dnb so early.